The order process, compared to the older system from which we ugraded at the beginning of this year has raised a few queries in terms of how to go about managing the order cart. In short, this system is a shopping cart which allows an order to be placed, paid for via EFT, and manually handled. We may consider online payments using Credit Cards and such in the future. In light of some of the queries we have received with regards to ordering our worm farms, worms, and other products, we have put a few questions, answers and guidelines up here and will continue to add more, for some guidance as to how the system operates. There are two methods which can be used to place an order in your enquiry cart. To add from the listing or product summary, simply click the cart icon. This will place ONE of the selected product in your cart. To add from the products main display and information page, simply click the button as shown above after selecting any options that are mandatory as displayed on the page. Here you can also select the Quantity of the product you wish to order. 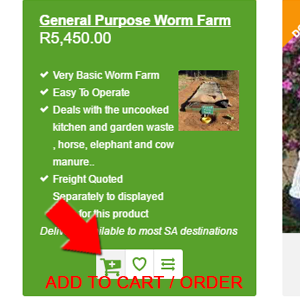 A GREEN confirmation strip will appear with a link to your basket / order which can be clicked to view your order summary and the contents of your order. 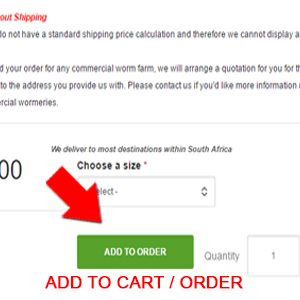 If a RED strip appears, you have probably been redirected to the product page where there are options for the product that need to be selected before the item can be added to the cart. You will then need to peruse the add to cart form with the options marked compulsory and click the add to cart button to finally add this item to the cart. The order remains active while you browse other products on the Wizzard Worms website. If you navigate away from the page where you placed the order, the order link in the header of the website will still be visible and is located on the right of the main menu of the website. Holding / hovering your mouse over the cart icon in the header will reveal another drop-down menu which has some functions that can be performed on your order directly from that menu. View Order Button: This will take you to the order summary where you can view the items in your basket. By default one item is added to the order. Ordering from the individual products page you will have an option to adjust the quantity of that product before you add it to the cart. Ordering from the summary page will not allow you to pre-select the quantity. Once there is one or are more items in the cart you have the ability to adjust the quantity on the order summary page. This can be reached by hovering over the cart in the main menu and selecting the View Order button. You will have your order displayed in a table. The quantity box in the "QTY" column can be adjusted here, and once adjusted, you need to click the "Update Shopping Cart" link below the table for the adjustment to take effect. We need to know who you are, so all fields in the section provided after proceeding to the checkout section need to be completed. -- Billing Information: By default it is assumed that the delivery and the billing address are the same. If they are not the same, simply "untick" the option "My billing information is the same as my delivery information" and the fields will be available to populate with the accurate information. There are not usually more than one option provided here and the shipping will be calculated per product where you have required shipping. For commercial products and one or two other products, we need to consult with you about delivery and shipping which will entail one of the Wizzard Wormers contacting you. We only offer EFT / Bank Transfer as a payment method at the moment. This may change in future. The Wizzard Worms banking details will appear on the screen and WILL ALSO BE EMAILED to you on completion of your order with an order reference number. Please make use of this field if there are any accompanying notes for your order, its delivery, or anything else that you think we may need to be aware of pertaining to the order. It can be left blank if you have nothing to say. The Review Order button takes you to a confirmation screen. No fields are editable and the background colour is BLUE. The displayed information is a preview of what you are sending us. Please review the information and if complete, you can press the Submit Order Button. If there are errors in the preview that need to be corrected, simply press the "Back" button to be taken to the previous screen. The order is only submitted successfully if the submit order button is clicked. If your order placement is successful you will receive a confirmation email and a copy of your invoice with the order number and banking details. Please check your spam folder if no email has come through. NB! NO order has been received if you have not received an email - because this means that the order process was not completed. In most cases, the shipping is worked based on options chosen. WORMS have an incremental fee for freight, and the amount for freight is based on the quantity ordered. COMMERCIAL UNITS require a separate bespoke quote for freight / delivery and a consultant will contact you on successful receipt of your order. The order will not be sent to us or entered into a database unless you have pressed the submit order button after on the Order Review page. If at this stage you close the browser window, and reopen it, the order may well still be present. Pressing the "back button" for your browser, or using the Order Cart links in the top menu, or pressing the green "Back" button at the bottom of the order review page to go back to the first page of the order process will allow you the option to empty the order cart / delete all the items in your cart. Note that no confirmation email will be sent to either yourself or Wizzard Worms confirming the cancellation; amd no order captured for your session. As at the 01-04-2017 our online orders only make use and accept Electronic Funds Transfers (EFT's) as a payment method. We may still in coming months elect to make available Credit / Debit Card Payments. If you have successfully submitted an order, an email is sent to us informing us of the order, the amounts, products and reference number generated. The reference generated for us is the same reference number for your order payment reference. Therefore, on making payment, and entering a reference, the reference number used and picked up on the proof of payment or our bank statement will allow us to successfully allocate the payment to the order. If you are still having issue placing or managing your order with Wizzard Worms, please contact us via email - thewiz@wizzardworms.co.za - or call us on +27 33 413 1837. Should you have any suggestions for us to cover a question here, please email thewiz@wizzardworms.co.za OR our webmaster, Jonathan, on info@practiwebs.co.za and the suggestion will be considered.